Eden Hazard knew he was facing one of the top defenders in world football in Virgil van Dijk during Chelsea’s recent draw with Liverpool. The Dutchman was instrumental for the Reds yet again as they extended their unbeaten start to the Premier League season at Stamford Bridge. He served as an unflinching foundation to his side’s lengthy search for an equaliser, which eventually arrived courtesy of Daniel Sturridge’s stunning strike in the 89th minute. In doing so, Van Dijk was key in thwarting the threat of a Hazard arguably enjoying the best spell of his career and playing the best football in the division. The Belgian has now deemed the centre-back as one of the hardest opponents to come up against. “Virgil van Dijk since last year is one of the best in the world for sure,” he told SPORTbible. 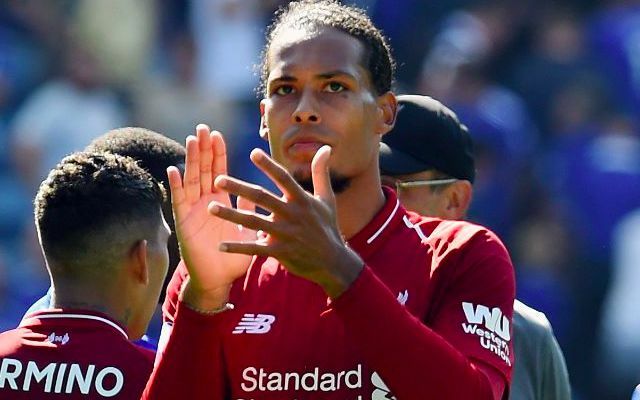 It continued an imperious start to the season for Van Dijk in which he has hardly put a foot wrong on the way towards six wins and one draw in the league. The world’s most expensive defender has rather bullishly buried doubts surrounding his transfer fee, imposing a supreme composure and assurance to rectify Liverpool’s woes at the back. He has meanwhile teased a formidable long-term partnership with Joe Gomez, who also produced a commanding performance in the capital last week. To contain a man in Hazard’s form with such authority is testament to the elite defensive standards Van Dijk has set on Merseyside.